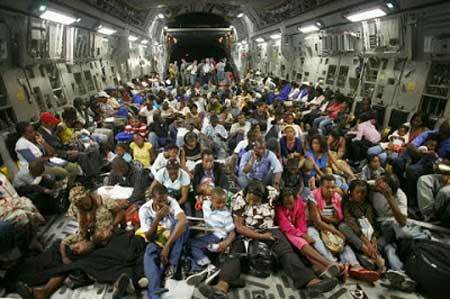 You are currently browsing the archives for the Refugee Resettlement Program category. It’s impossible to picture the St. Cloud City Council opening an investigation into Mayor Kleis or the program’s principles unless his name was Jeff Johnson. St. Cloud’s City Council has too many misinformed, gullible people on it to do something smart like open an investigation. Rest assured that Judicial Watch will get to the bottom of this situation. It might take some time but they’ll find out what’s happening. 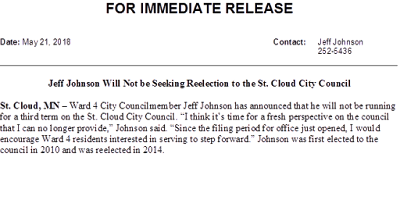 Actually, this initiative is the direct result of the city council’s mishandling of Councilman Johnson’s resolution and the disrespect shown to the people by Councilman Goerger. The night that Councilman Goerger presented his resolution, the City Council intended to ambush Councilman Johnson and the people. Councilman Goerger’s resolution was given to the Council literally minutes before the vote. Discussion was limited at best. Later, Councilman Laraway called the question in an attempt to stop debate. The vote was taken on whether to end debate. In her confusion, Council President Lewis adjourned the meeting without voting on the resolution. Councilman Johnson’s resolution wasn’t seriously debated. Further, people supporting Councilman Johnson’s resolution never got the chance to testify. It was the most disgusting, chaotic City Council meeting I’ve ever watched. Council President Lewis looked as confused as Speaker Kelliher did on the final night of the 2007 legislative session. That night, Kelliher looked dazed and confused. But I digress. “To me, the U.S. Constitution is very clear. It gives only Congress that authority. It’s not the state. It’s certainly not the county or the city,” he said. Without question, the Constitution gives Congress the authority to work with local units of government. In fact, without that ability, it’d be impossible to smoothly administer the laws Congress enacts. Mayor Kleis knows this. Furthermore, the resolution itself troubles Kleis because it’s similar to a resolution proposed by City Council member Jeff Johnson last fall to pause refugee resettlement here until a study determined the costs associated with it. Last fall, Kleis said immigration and refugee resettlement are not city issues. He shared the same sentiment Wednesday. What a pile of BS. Shame on Mayor Kleis for making that flimsy argument. First, I won’t dispute the fact that immigration and refugee resettlement policy is set by the federal government. What I’ll passionately dispute is Mayor Kleis’s statement that this isn’t a city issue. It’s costing city taxpayers money. If Mayor Kleis wants to argue that there isn’t a cost to the city budget, I’ll passionately dispute that, too. Does he really want to argue that there isn’t a cost to the City for health inspections of refugee-owned restaurants? Will he argue that there aren’t any law enforcement costs related to refugees? Just because there isn’t a line item that’s titled ‘Health Inspections — Refugees’ doesn’t mean there isn’t a cost associated with it. Further, saying that there isn’t a cost with educating refugees, while not officially on the City’s operating budget, is foolish. How much property taxes do city residents pay to ISD 742 to pay for translators and English learning for refugees? Mayor Kleis, why shouldn’t citizens have a say in such matters? It isn’t like you’re opposed to taking federal money for other things. Why are you opposed to telling the federal government that it has to pay for the people it dumps in our laps? It’s that or they reform the law so that it requires Volags to pick up the entire cost associated with resettled refugees. Mayor Kleis, you should ask one of your legal eagles whether it’s legal to restrict the people’s ability to address the city government in terms of their grievances. If they’re honest with you, they’ll tell you that restricting the petition process to only ordinances is unenforceable because it violates the First Amendment. The St. Cloud Times has written some unfair things about Councilman Jeff Johnson, especially in their Our View editorials. This article, written by Jenny Berg, at least gives Johnson’s side of the story. First of all, I don’t think a man who just silenced a citizen who wanted to speak should be taken seriously. This past Monday, that’s what Libert did when he objected to Johnson recognizing John Palmer to speak. That’s something a tyrant does. There’s few things more disgusting in a constitutional republic than having a member of government silence a citizen. That’s what Libert did. But I digress. I know many of the people that Libert is referring to. He couldn’t be more wrong than when he calls them “anti-immigration people.” The people that disagree with Libert just believe strongly that Gasp! the laws on the books should enforced. Libert agreed Johnson’s proposed refugee moratorium has fostered an “atmosphere of hate and bigotry” that works against the city. “I think as a council member our job is to promote St. Cloud as a very viable, living, healthy community. If you Google St. Cloud and all that comes up is immigrants and hate and bigotry, it’s not good,” he said. Here’s a bit of advice for Mr. Libert. The job of city council members is to put in place smart policies to make the community attractive and to put in place a budget that funds public safety, transportation and other important core functions. St. Cloud is heading in the wrong direction. Businesspeople know this. They won’t admit it in public but they know it’s heading in the wrong direction. Businesses are shutting down or leaving. Unemployment is solid but wealth keeps leaving. Crime is rising. Mr. Libert, how can you promote a city with those problems festering? If you’re saying ‘things are wonderful’ while these other things are falling apart, people will eventually conclude that you aren’t honest. That’s the point at which they tune you out, then vote you out. 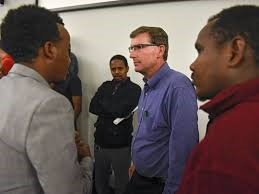 Laraway, who is a member of the CentraCare Health Board of Directors, said the company has more than 700 open positions and that he’s worried the negativity surrounding immigration issues could hamper attempts for companies such as CentraCare to attract workers. Hint to Laraway: pretending that everything is fine won’t fix the refugee problem. People aren’t moving to St. Cloud because they don’t picture it as a nice place to live. If you continue burying your head in the sand on these issues, CentraCare’s problem will only get worse. If you won’t fix these problems, step aside and let someone who’s serious be part of the solution. Volunteer agencies (like Catholic Charities and Lutheran Social Services), aka Volags, have used the resettlement program as a cash cow. The State Department pays Catholic Charities and LSS $3,300 to resettle refugees. The Volags are required to spend $2,300 on the refugees. Once the Volags have found the refugees a place to live, they get to keep $1,000 for their services. Based on this information, Catholic Charities’ refugee resettlement revenue dropped from $3,000,000 in 2016 to $950,000 in 2017. A $2,000,000 drop in revenues will require Volags to rethink their business model.